Whether you’re organizing a company soiree or throwing a party for networking with clients, a corporate yacht charter is the perfect solution. Given their versatility and customizable options, yachts provide a luxe backdrop while you wine and dine with potential clients. With a full crew and endless amenities, a corporate yacht charter will provide your guests with unforgettable entertainment and a lasting impression. 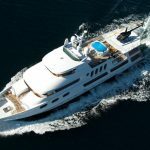 Many companies have chosen to opt for corporate yacht charters for their events, as it is relatively easy to arrange compared with the traditional option of having to rent out a location, find a catering company, and hire suitable entertainment. Once at the event, some companies have experienced frustration with poorly trained staff and subpar food, which can be embarrassing in the presence of clients and often reflects poorly on the company. With a corporate yacht charter you can have the whole package without the hassle. If you’re throwing a corporate party for networking with potential clients, a fully-crewed corporate yacht charter is sure to impress. Trained and competent staff will free you up and allow you to carry on with your business, while attentive servers and bartenders cater to your clients’ needs. Immersed in total luxury, you can confidently offer new proposals and network with clients as you sail past the city skyline and enjoy the elegant ambiance. What better way to foster team building and boost company morale than with a chartered yacht for the day? Many companies have also used corporate yacht charters to host teambuilding events. After so many in-office meetings and long hours, workers can become stagnant and creativity plateaus. Often, a little change of scenery is just what they need. Instead of the usual team-building exercises that employees typically dread, companies have recently opted for corporate yacht charters to allow their employees to relax and develop camaraderie. If your company is launching a new product or celebrating quarterly success, a yacht party is sure to be remembered by your guests for years to come. Your clients, employees, and investors will be charmed by the high standard of elegance that a corporate yacht charter provides. With options available such as DJs, models, and entertainment, your guests will love living the life of luxury for the afternoon. Some companies have even used corporate yacht charters for holding annual board meetings. Whether you choose to book a catered brunch or exclusive dinner meeting, a yacht charter breaks up the monotony of mundane meetings and allows your executives to brainstorm and network away from the typical conference-room atmosphere. This in turn shows gratitude on behalf of the company, which fosters more hard work and productivity in the long run. Your board members will appreciate the hospitality of courteous servers and bartenders while they conduct business away from the daily grind of the office. Whatever your needs may be, ENB Yachts can help match you up with the perfect corporate yacht charter to provide an unforgettable experience for your company.